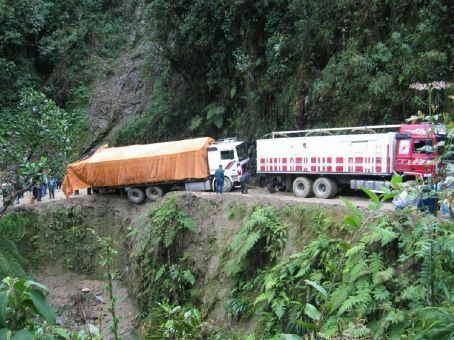 The North Yungas Road in the Bolivian Andes has been officially declared as the “world’s most dangerous road” – for motorists! Mountain bike enthusiasts however, are cut from a different cloth, and it has become a favorite destination for downhill racing – now that has got to be a serious adrenalin rush! 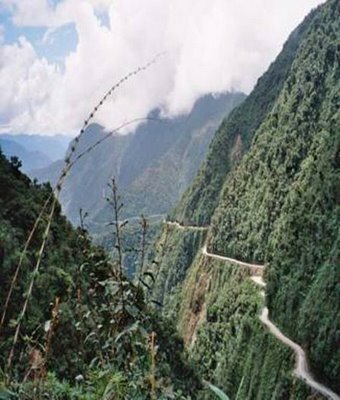 It is just short of 70 km long and runs from La Paz to Coroico, descending over 3,500 metres and regular occurrences of 800 metre abysses and impossibly narrow hairpin curves. One wouldn’t expect a road leaving one of the highest cities on the planet to go uphill – but in fact it does – almost five kilometres above sea level, where even a normal internal combustion engine struggles to ‘breathe’. On average between 200 – 300 fatalities are recorded every year. This is freakish – that is (playing with statistics) – one person dying every 3 days! The route is littered with the remnants of many, many accidents, with many trucks and buses lying wrecked, at the bottom. They will probably never be recovered. The buses and heavy trucks navigate this road, as this is the only route available in the area. Buses crowded with locals go in any weather, and try to beat the incoming traffic to the curves. One of the local road rules specifies that the downhill driver never has the right of way and must move to the outer edge of the road. This forces fast vehicles to stop so that passing can be negotiated safely. Because of the extreme dropoffs, single-lane width, and lack of guardrails, the road is extremely dangerous. Further still, rain and fog can make visibility precarious, the road surface muddy, and loosen rocks from the hillsides above. 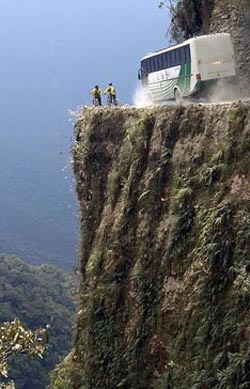 On July 24, 1983, a bus veered off the Yungas Road and into a canyon, killing more than 100 passengers in what is said to be Bolivia’s worst road accident. High in the Andes, they are building a new road, a bypass to replace the old one. But this is Bolivia, and already it has been 20 years in the making. Who knows when it will be complete? Until it is, people will have to continue offering up their prayers, and taking their lives in their hands on the most dangerous road in the world. batman, I thought I would provide you some updates on your piece. 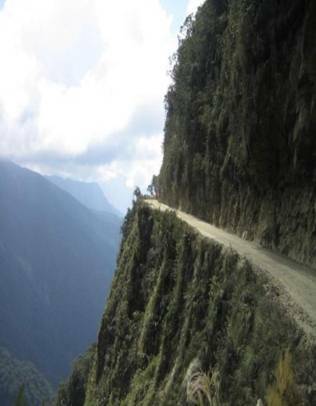 1. the new road that bypasses the "WMDR" (World's Most Dangerous Road) was completed in February of 2008. 2. Since then 99% of the traffic goes on this new road. 3. This means that the WMDR is no-where near as dangerous as before (but just as spectacular). 4. Companies like ours take travelers on this road by mountain bike as a day tour, giving them an opportunity to experience the thrills of the road in a relatively safe way on a 95% downhill bike ride. I hope this was a helpful update. thank you very much for the update – i was unaware that the alternate route had been completed, and appreciate any contributions to make my posts more accurate. I want to raise a question. 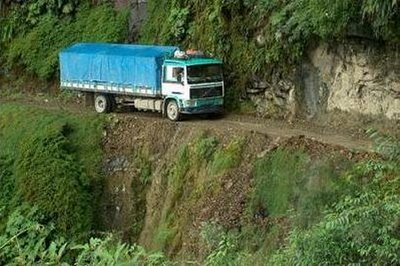 if everybody knows this is the only route for the buses & trucks in this area, then why don't they do their work of building a road seriously and quickly? I've watched the History Channel program on this road. I have a stupid question. Why don't the Bolivians simply alternate traffic on the road. One way traffic alternating every other day. Eliminate ANY traffic meeting other traffic. This is just too simple not to figure out. Have a guard house at each end and the appropriate hour (whatever that is) just stop the traffic flow on a given day and start the traffic flowing in the opposite direction. Give the "last car of the day" a card to turn in upon finishing the trip to notify the traffic cops to start the flow in the other direction. Allow NO passing on the road in efforts to insure that there is an absolute awareness of the last car out.